If you think brute strength is all it takes to be good at arm wrestling, think again. Although strength is important, you also need good technique, good leverage, quick instincts and strategy. The sport dates back thousands of years to 2,000 B.C. and now arm wrestling competitions are held worldwide. 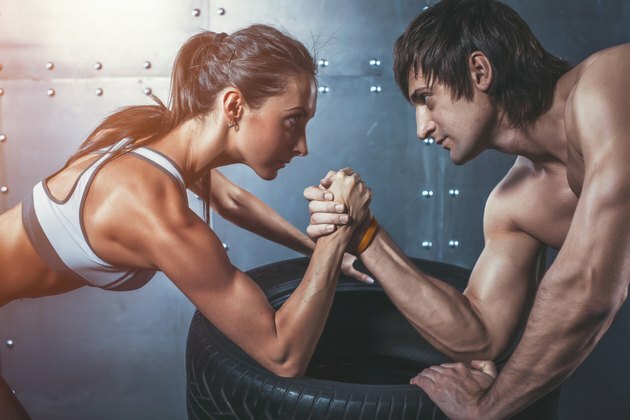 You may not need to know the rules for a friendly challenge, but if you compete in official competitions, you'll need to know the rules and regulations set forth by the World Armwrestling Federation. The WAF recognizes several male and female, right and left arm age divisions. Children age 12 and younger compete in the Sub Junior division. The Junior division is for children age 18 and younger. Anyone older than age 18 can enter the Senior division. If you are age 40 and older, you can compete in the Masters or in the Grand Masters division if you are older than age 50. Each age division offers several weight classes, and participants will be weighed in before the start of the competition. You can compete while standing or sitting. The height of the table for standing competitions is 40 inches from the floor to the top of the table and 28 inches from the floor for seated competitions. The table measures 36 inches across and 26 inches deep with two, 1-inch round, 6-inch high pegs. The pegs are positioned 1 inch in and halfway along the edge. Competitors rest their elbows on 2-inch thick pads, 2 inches in from their respective edge. Touch pads are angled and 1/2 inch from their respective edge. During world competitions, you must wear a uniform identifiable to your country. In all competitions you can only wear short sleeve or sleeveless shirts with limited advertising. Shoes are required and jeans are not allowed, only sports pants. You're can't have any type of wrap, support or bandage on your arms, and rings are not allowed. A referee can, however, allow a bandage for a cut. If you have long hair, it must be pulled back or restrained in some manner, and hats are not allowed. The proper setup requires a palm-to-palm grip with your thumb knuckle showing. Your gripped hands must be level over the center of the table and your wrists must be straight. The rules state your shoulders must be square to the table, your free hand must grip the hand peg and your free arm may or may not touch the table. You can wrap your leg around the leg of the table or brace it against the opposite leg as long as it doesn't interfere with your opponent. You have one minute to "grip up" and if you can't, a tournament referee will set your hands. There are several ways to win or lose a match. Pinning your opponent -- forcing his hand, from the wrist line to his fingertips, to touch or go beyond the touch pad -- wins you the match. Committing two fouls in the match, failure to go to your table within 60 seconds of when you were called or suffering a match-ending injury causes you to lose your match. You also lose the match if you commit a foul when your hand is a more than two-thirds of the way down toward the losing touch pad. You'll be given a foul if you bend your wrists, move your fingers, or re-grip after a referee has set your grip. If you lift your elbow vertically off the pad to gain an advantage, you've committed a foul. Intentionally slipping out of your grip results in a foul. A foul is given if you lean and allow your shoulders to extend past the center line of the table results. You'll also be given a foul for poor sportsmanship, using bad language or abusing an official.